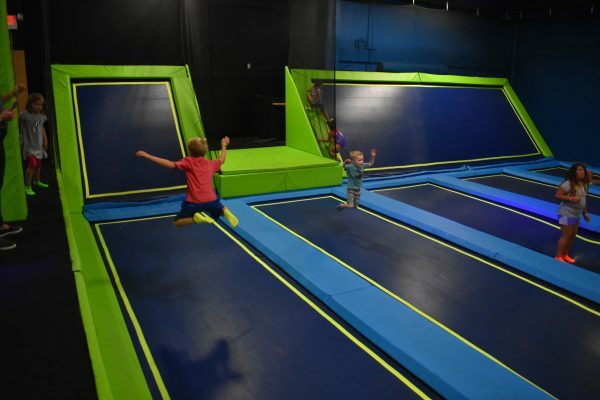 This week we found ourselves in Ogden at an amazing new trampoline park. 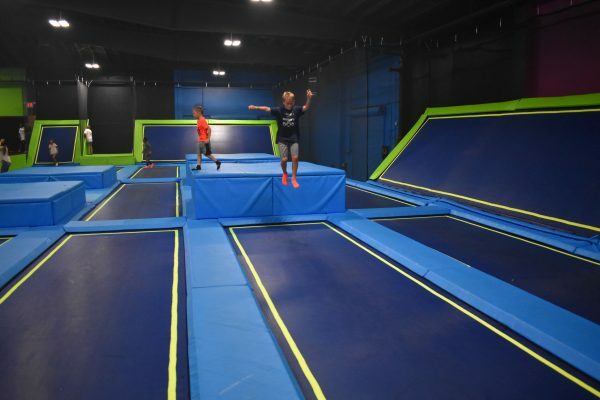 We’ve been to a few other places to jump, but this one was our new favorite mainly because there was so much more to do than simply jump on trampolines. 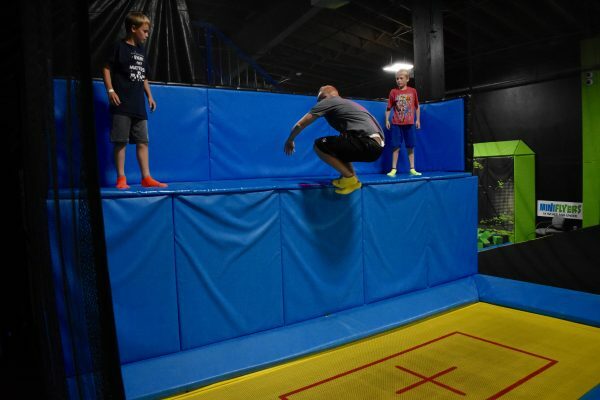 Fly High Adventure Park even has “Adventure” in its name, instead of just being a trampoline park. First of all, the size of Fly High is massive. There are two levels and both have a lot of things to do. Our boys’ favorite activity downstairs was dodgeball. 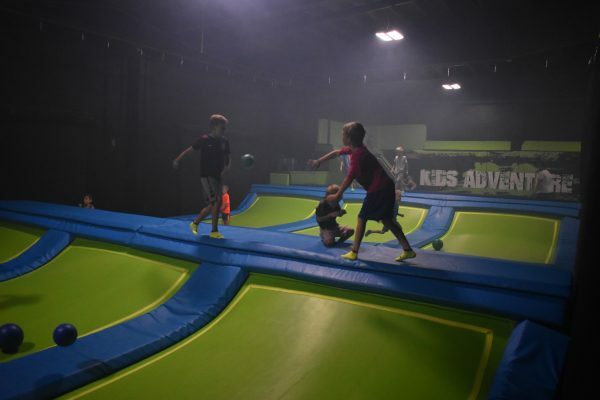 This gave them the opportunity to throw balls at each other while jumping on trampolines. In the middle of each side is a low hill, and the boys spent nearly an hour jumping and throwing, jumping and throwing. 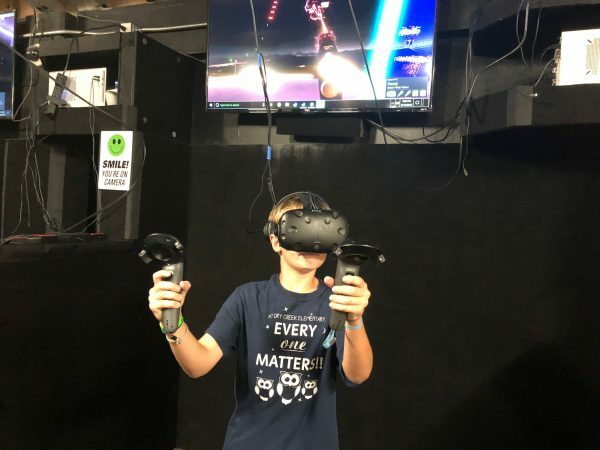 There is a lot to do at Fly High Adventure Park. Dodge Ball was a lot of fun! 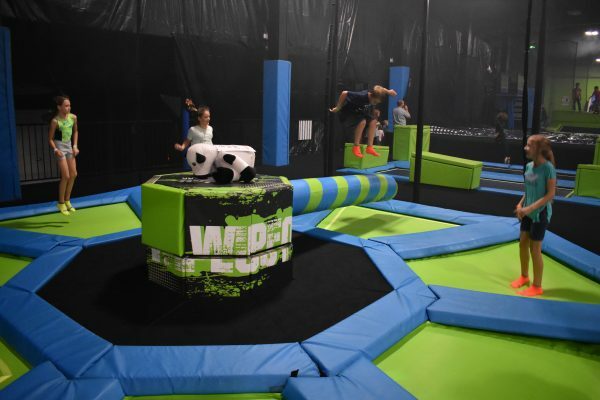 There is also a huge swivel arm that swings across twelve individual trampolines. The arm is large and padded, so if you don’t time your jump correctly it will wipe you out. Even our youngest liked jumping the arm or ducking under it if that seemed to work better. Still, he was knocked down more than once, but each time he bounced right back up with a smile on his face. We all loved jumping over this swivel arm. 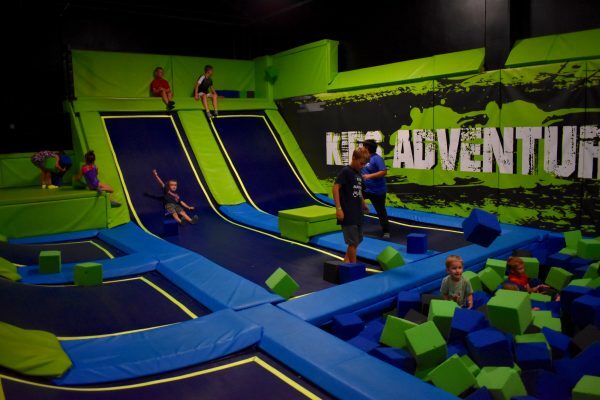 There are a lot of areas to run and jump, including angled trampolines and large pillow pits. One gigantic pillow pad even allows you to jump down from the upper level. Our boys weren’t quite big enough to do much on the obstacle course, which required jumping, hanging, and swinging from bar to bar. There are tall walls to hop on to. See the trampoline socks we are wearing? Everyone is required to have a pair. 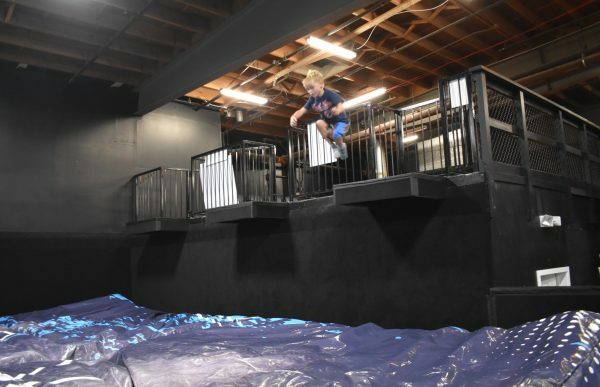 There are slides and ball pits to leap into. There is a ton to do! We enjoyed these angled trampolines as we did flips and tricks. The obstacle course required more arm strength than our boys had, but they had fun trying! Upstairs there are some fun things, too. 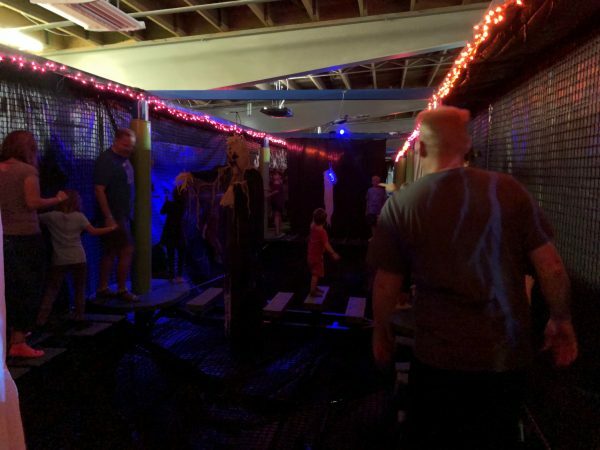 We liked the upstairs obstacle course, which was more kid friendly. 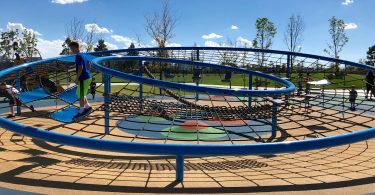 It has a net that keeps you from falling too far and has you walking on narrow ledges, hopping from spot to spot, and clinging to ropes with platforms. 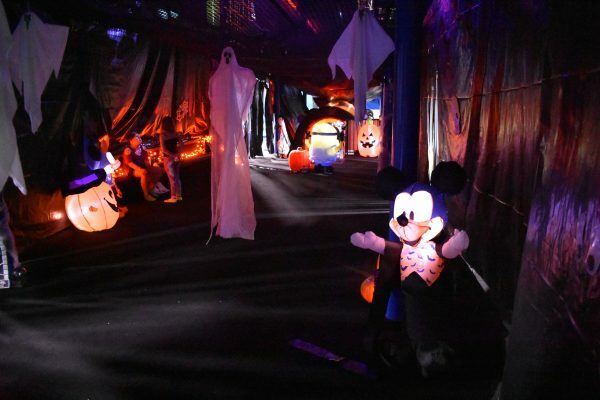 When we visited it was all decorated for Halloween. 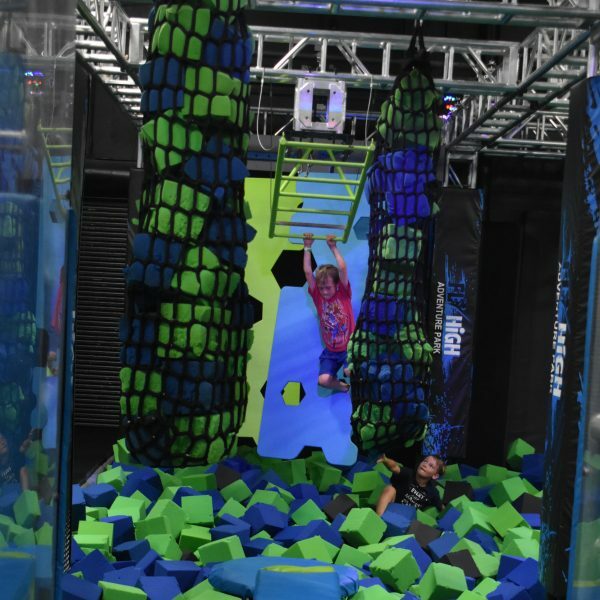 The upstairs obstacle course is great because there is a big net underneath to catch you if you fall. You could jump off this high dive into a pad. We also had our first opportunity to try virtual reality. There were two games: the kids opted to shoot aliens while Dad took on zombies. It’s like a video game all around you. Best of all, our 6 year-old was also allowed to participate. 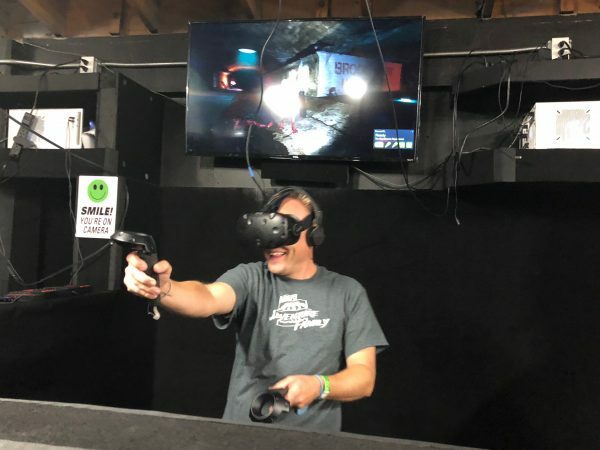 We were surprised at how well he shot down alien attackers while blocking with his “shield.” Virtual Reality is an extra cost in addition to your admission fee. Our boys said this was their favorite part of the park! Virtual Reality was very interesting. Our boys all loved it! Dad was a huge fan! 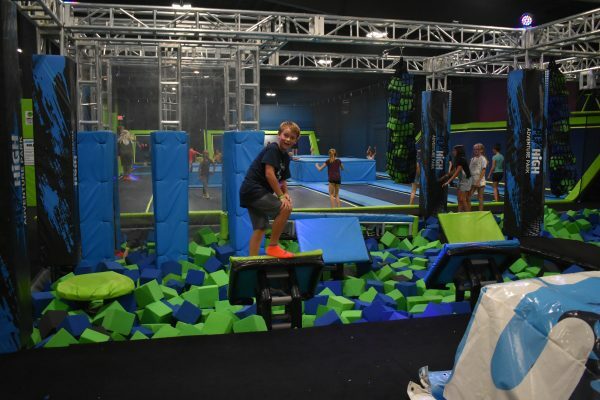 Fly High Adventure Park is our favorite trampoline park because it is so much more than a trampoline park. 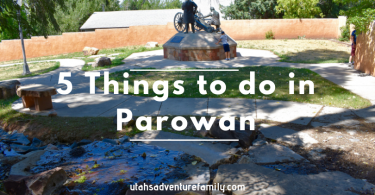 There is entertainment and fun for everyone. 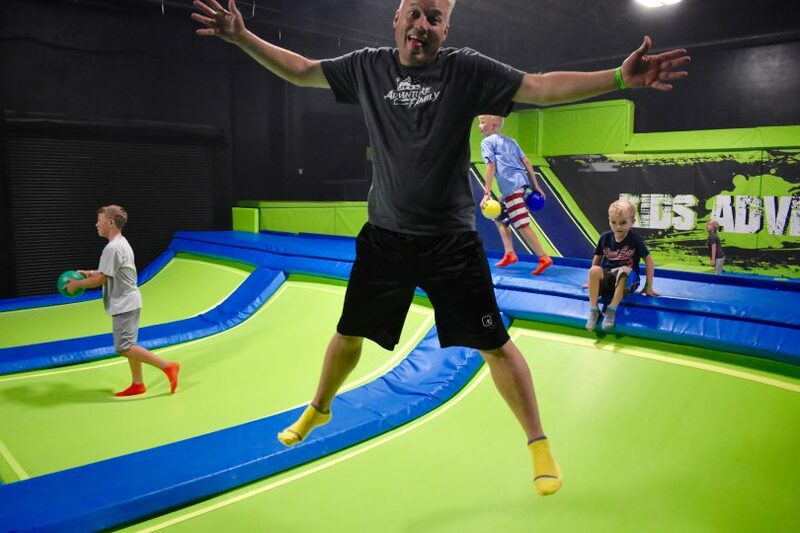 This place is great for all ages. We couldn’t believe how much there was to do. We could have spent all day playing. 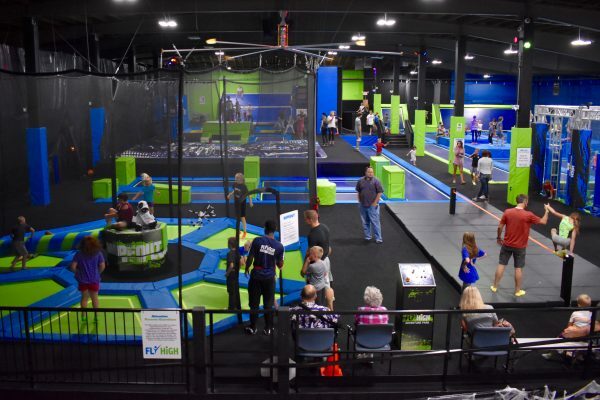 Fly High Adventure Park is located at 3624 South 250 West Ogden. Fill out the waivers online before you go. This saves wait time when you get there. Bring water! You will be so thirsty after jumping for an hour. Special trampoline socks are required. They are $3/pair. But you can wash them and use them over and over again. Check out their daily specials. There is buy one hour get one free on Tuesday evenings! There are also some great Groupon deals right now (November 2018). It’s hard to keep track of your children in such a large place, so plan ahead for meeting places or how you will stick together.